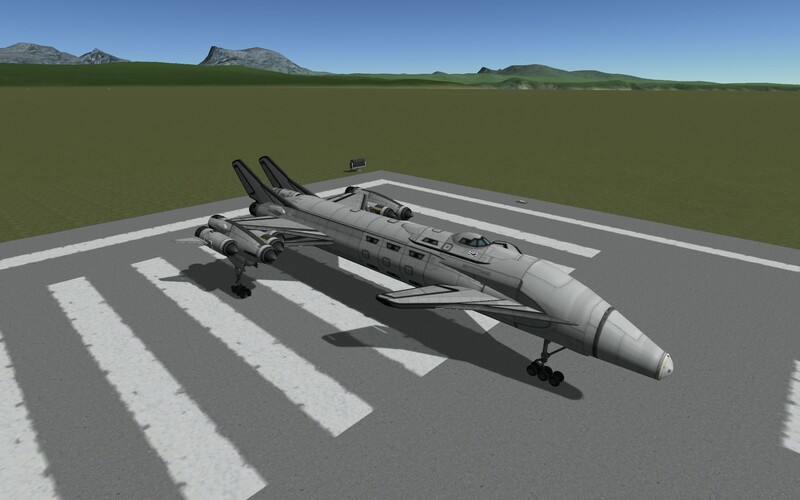 A stock aircraft called 60 Seat SSTO. Built with 191 of the finest parts, its root part is adapterMk3-Size2Slant. 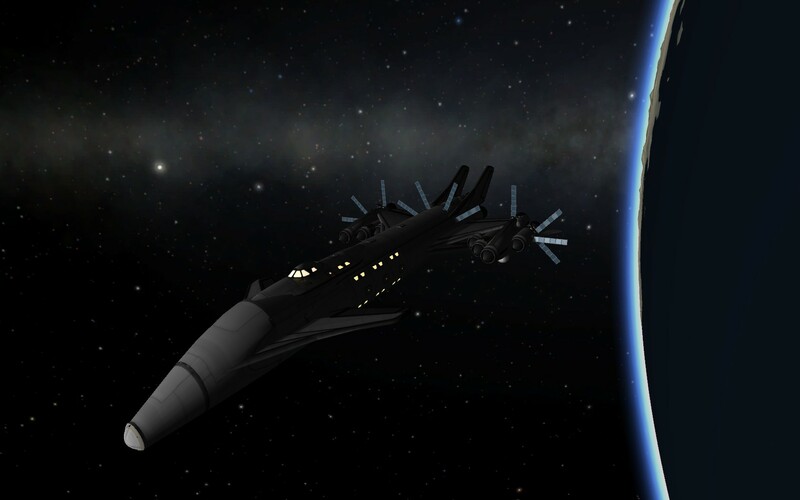 This craft can reach orbit with about 4 km/s of delta V if flown correctly and can hold 60 passengers as well as 2 crew. When taking off, hold the brakes until the R.A.P.I.E.R. engines reach 80 Kilonewtons of thrust, this maximizes how much runway you have to accellerate to take off speed. Let the craft fly of the end of the runway and try to stay close to sea level until the craft reaches 400 m/s, at which point gradually pitch up to 20 degrees on the Navball. When the craft reaches 8 kilometers hold prograde until the craft naturally gravity turns such that the prograde marker is about 5 degrees towards radial out on the navball, at such point switch the SAS to stability assist, you shouldn’t touch the controls from here on out till furthur specified. The craft should reach about 1520 m/s before it begins to decelerate, once it does activate the nuclear engines and switch the R.A.P.I.E.R. engines to closed cycle mode. cut engines once apoapsis reaches 71 kilometers, position the craft such that the lift from the wings is enough to compensate for drag to keep the apoapsis above 70 kilometers. wait till around 12-10 seconds before reaching apoapsis, then throttle up the engines while holding the prograde marker. The R.A.P.I.E.R. engnies will run out of oxidiser before you fully circularize, but at this point it will only take a few more seconds of burning the nuclear engines to circularize. Now that you’re in orbit the sky is the limit, Kind off. 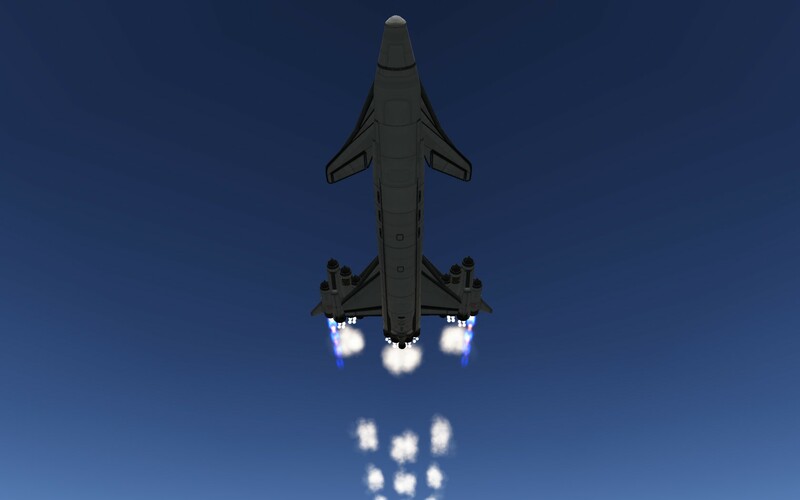 This craft does suffer from a few issues, namely that it’s thrust to weight ratio using the nuclear engines is quite low, possibly high enough to land on the mun, though that really is the limit. This craft is primarily designed to reach destinations like Laythe, and maybe even Duna if your a skilled enough pilot. Though it can easily reach destinations like Ike, Bop or Pol, Gilly, and others. It could possibly reach bodies like Eeloo if more nuclear engines and fuel was added. But in it’s current state it cannot. 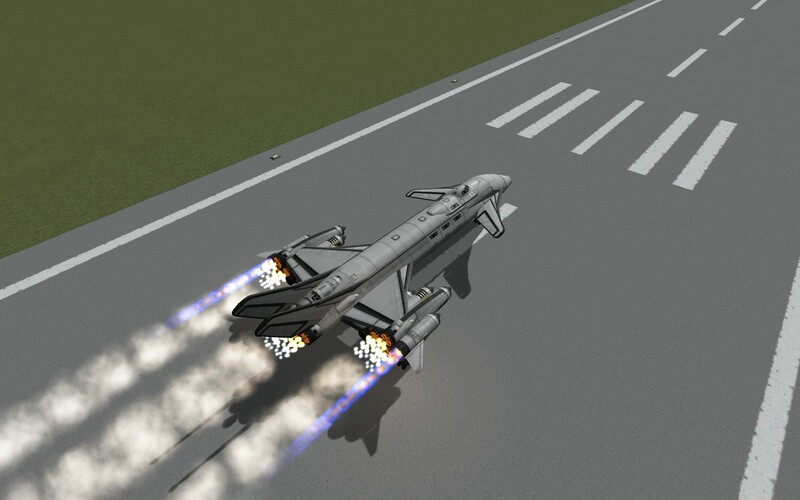 I would not recommend this craft if your not the most experienced pilot, I designed this craft to make use of gravity assist routes to reach more difficult destinations, Without using gravity assists this craft can only reach the Eve and Duna system, and even then those are difficult to reach if you don’t know about transfer windows.